New Delhi: Nearly 80 percent of senior citizens in India do not undergo bone surgery thinking they won’t be able to recover post operation, say orthopaedics. They say majority of the people also rely on analgesics (pain-killers) for several types of bone-related pain which further develops other problems including kidney failure, diabetes and obesity. “In India, old people are struggling with knee problems and limiting their lives to beds. They consider it not just part of ageing but also think that surgical options are risky in old age and non-recovering,” said L. Tomar, orthopaedic surgeon at Max Hospital. He said that in 75 percent of the cases, people only rely on medicines and not surgery, which develops other problems like kidney malfunctions and intestinal bleeding. Nearly 90 percent of people suffer from damaged knee joints by the age of 60-65 years, and in majority of the cases, the condition can be prevented by a proper lifestyle and food habits. According to doctors, 80 percent of the people in urban India suffer from Vitamin D deficiency, which is the sole reason behind decrease in the bone mass density, leading to the increase of osteoporosis. Tomar said Indians were among the least aware people on various types of joint replacement surgery, which are highly beneficial even in joint problems in old age. “They do not know about advanced surgical procedures like minimally invasive technology in knee replacement surgery which ensures efficacy, and simplicity and more flexion in knees as compared to conventional surgeries,” said Tomar. India currently is home to 2.7 million arthritis patients, experts say, and the figure is growing fast. “Arthritis is the most common form of knee joint problem. That is a bone degeneration disorder which breaks cartilage, a spongy cushion between femur (thigh bone) and tibia (shinbone) and exposes both the bones to rub off each other and make them rough and inflamed,” said Deepak Kumar, an orthopaedic at the All India Institute of Medical Sciences (AIIMS). 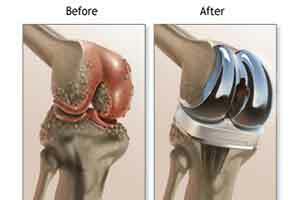 “With minimally invasive technology, knee replacement has become far more effective compared to conventional methods. In fact, with this technology, even old people like those of 80 years or even more could safely undergo knee replacement, that too with assurance of almost absolute normal locomotive recovery,” added Kumar.